Hello and welcome to another edition of Living Large In Small Spaces. 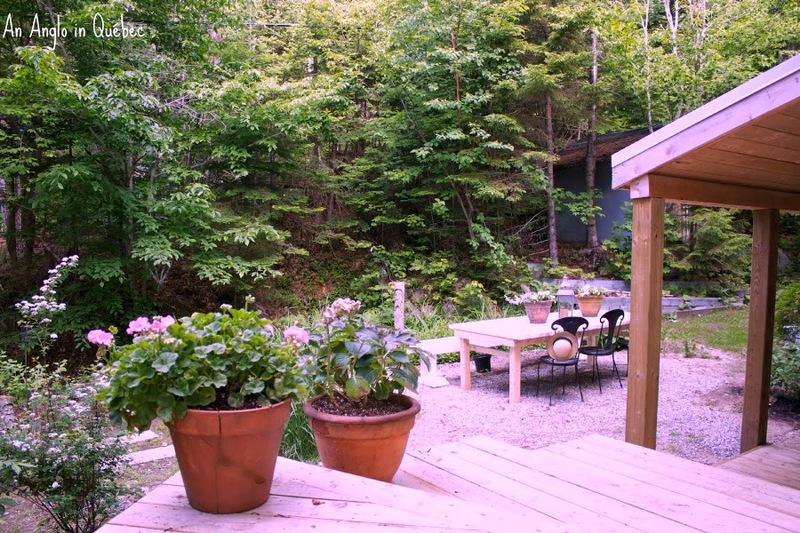 One month ago today I discovered Donna's blog An Anglo In Québec and was instantly enamored with the charming cottage she shares with her husband. 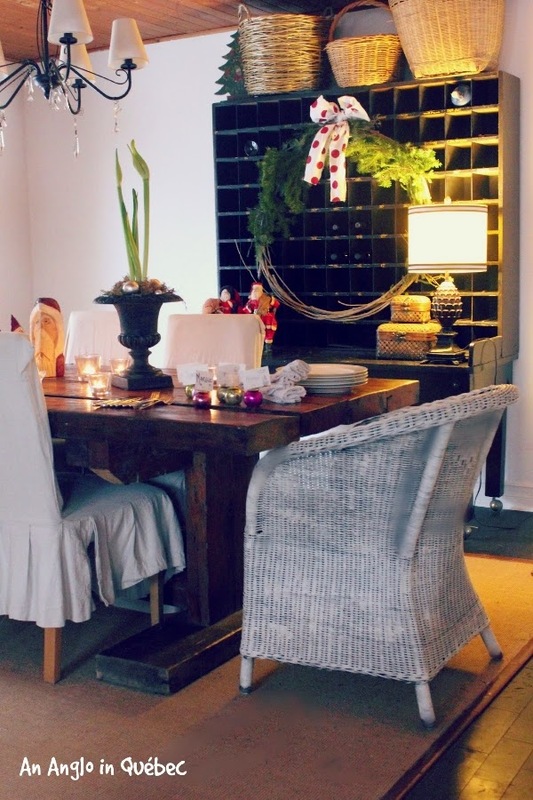 Donna has a great eye for design and has created beautiful spaces in her modestly sized home. The kitchen, living room, dining room, pantry and a bathroom make up the main floor, which has been completely renovated. Three small bedrooms and another bath comprise the top floor. I asked Donna if I could share her home in the Living Large series and to my delight she said yes. When I saw her answers to my questions via email, I knew we had to do this segment in Q&A style. Our emails were truly like a conversation between friends over coffee. Sit back and enjoy Donna's home and our discussion. 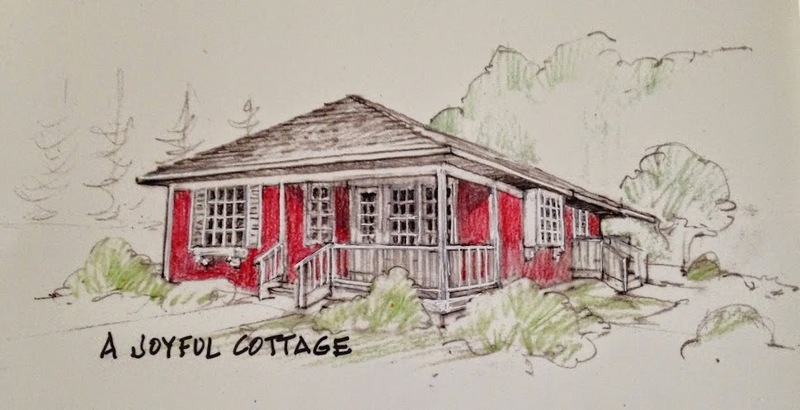 A Joyful Cottage: Donna, how long have you been in your home? Donna: We bought our home in the summer of 1993. We were expecting our second child so we were anxious to get out of our little apartment in Québec city and into something more practical. We also wanted a yard for our two children. So now 23 years later this is truly the only place that we have called home. AJC: Was this your first home purchase? Donna: This was our first home purchase and at the time I really thought it would be a starter home. My husband loved the home much more than I did at the time. There were elements to this house that really threw me off. The 70's style feel to the house was playing havoc with my design ideas at the time. Plus we were coming from an apartment which dated back 100 years or more and included character features such as beautiful woodwork and french windows. So this was a shift in thinking for me. I did love the location. We can see the lights of the ski hill from our kitchen window and we are both avid skiers so that was good. I also loved the sense of adventure that the back woods provided for our children. But the house love, well, that was really about my husband. So, at the time I figured we would do some minor changes and sell it. We actually did put it up for sale about 5 years later, but in the end the house we wanted did not work out so we decided against selling. I am so glad that we did; that really made us move forward with renovations. We completely shifted our thinking towards making this house everything we wanted in a home. AJC: Your house dates back to the 70's. Is that right? Donna: Yes, this house was built in 1975. It was one of the first homes built on this high hill which faces a ski hill. We have a pond in front of our home and several of the original homes were built around the pond. It is all wood which is very typical of the ski chalet style homes in this area. The 70's kitchen before the renovation. 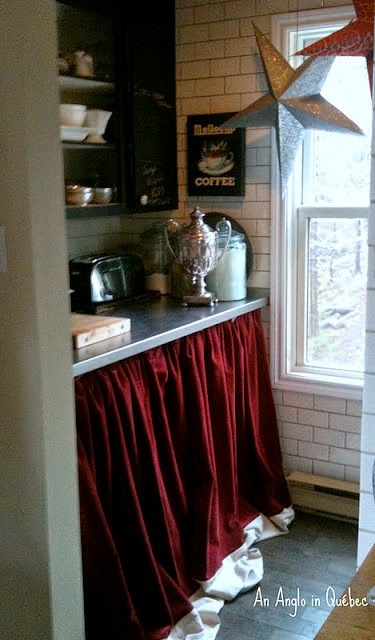 The pantry skirt may change with the seasons or on a whim. AJC: Do I understand correctly that there was no fireplace in the house when you bought it, and that you had that beautiful fireplace installed? Donna: One of the first indoor projects was to move an old wood stove from the basement up to the main floor. It was over-heating our basement and I was always worried about our children and their friends touching it. There was an acorn style 70's fireplace on the main floor which was sort of cute but in our cold climate it was causing us to lose heat due to its poor design. I see they are back in trend but I am sure they have a much better design.We made the decision to install a custom high-efficiency fireplace a couple of years ago, shortly following our kitchen renovation. That was a scary decision for me as I was afraid such a massive structure would eat up our living room space. But, I LOVE it. We enjoy it all fall, winter and early spring. 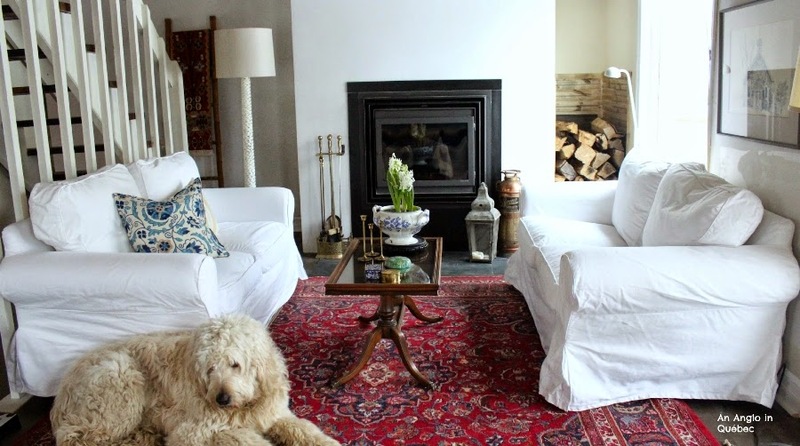 It really makes a huge difference to our home for heating purposes and design and adding a "cozy" factor. It is one of the best on the market since it goes beyond all environmental norms for being a clean heat source. We can actually cook on it as it has a built-in rack feature. We do that from time to time with friends and family. It also has a built-in fan to push heat through various vents in our home. Anyway, all that to say that it was a good investment. AJC: Is your gorgeous dog's name "Jack"? Do I have that right? Donna: Jack it is. He is our third child. :) We have had several dogs over the years but Jack seems to be the one that has had the greatest impact on all of us. He is a golden doodle and if you know anything about that breed then you will understand how "human" like they can be. "The living room runs across the front of the house and we decided to break it up into the area around the fireplace at the one end and the little reading area at the other end. But really, as you know, in a small space like this it never really feels like two separate spaces. It is more about the arrangement of furniture that allows for that sense of two areas." AJC: Did you hire contractors to do the work? It's all so beautiful. Donna: For the big jobs, yes. 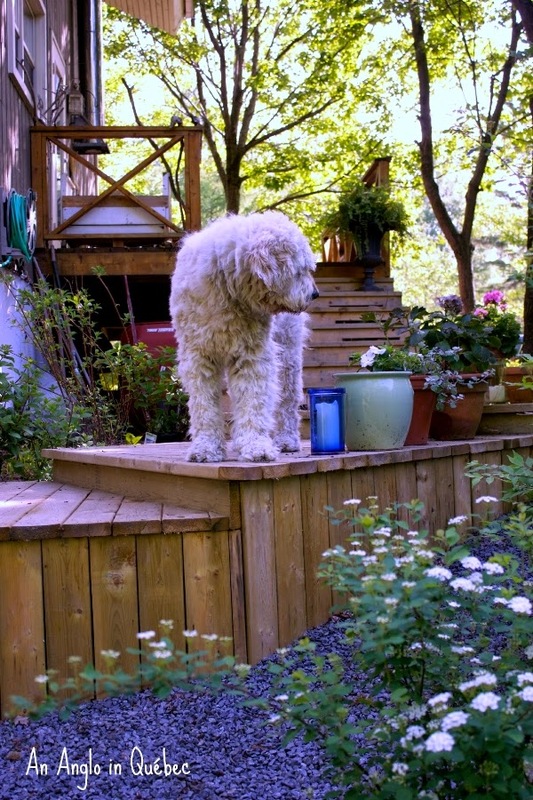 We discovered a local contractor when we made the decision to put on a new deck. That was one of the first big projects that we did. We had a very small deck off the front and a very dangerous deck on the side. I felt that it took away from the look of the house and it was completely impractical. 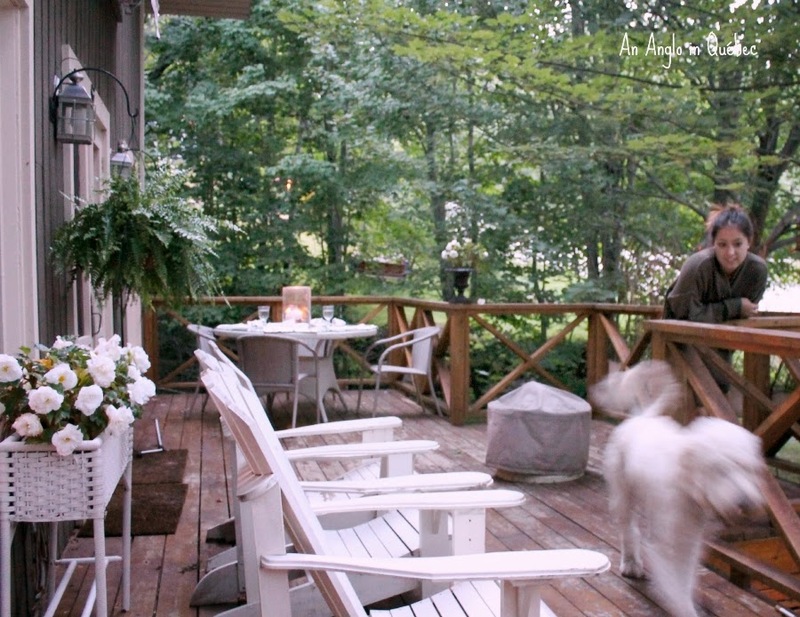 You could not sit on the front deck without your knees touching the railing. :) We have done some of the smaller renos, plank walls etc. but the bigger stuff has been managed by me and carried out by him. I am always very involved though to ensure that the budget gets maintained. To date, we have really lucked out on the costs and nothing has been unreasonable. And, of course we have done it in stages. I sourced out the wood floors and got 'cast-off' flooring which we love but the pieces are shorter than the standard length. That was our approach to everything. AJC: I've read your renovation posts and see that you've really done a lot to your home, and that you have more in mind. What else are you planning to do? Donna: I did not realize how much I would enjoy turning this somewhat bland space into our home. Of course we are always on a very tight budget and have to be selective in our choices. Next up is the upstairs bathroom. I have met with our reno guy to see what he says and it looks like we can do what I would like to do within a reasonable budget. That might not happen until next winter though since we have plans to travel this spring and summer. I always have small projects that I want to complete such as new doors for the upstairs bedrooms and painting the floors. They are old pine floors but not of a high quality pine. Certainly they are not worth sanding so I am going to paint them all in a creamy white. Perhaps one day I will do them in a similar wood to the main floor but right now I love the idea of the painted floors. I think it will work well in this house and lighten up that level. 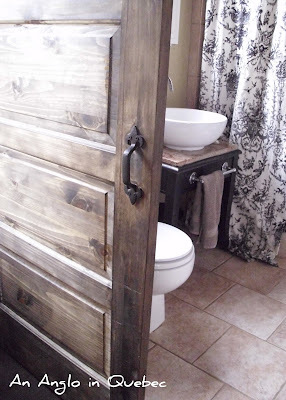 I am also thinking about adding shutters this summer...functional shutters that actually open and close. I like this idea and I think it would add a bit more character to the facade of our house. We did a lot by removing the "wings" that were on each side of the front wall of the house. Not sure you will see what I mean by that but now I feel like it needs a little grounding and I think shutters will do that. Also, our new doors on the side, which acts as our front door has done a lot to change our entrance and the facade of our home. I have a few projects around on that side too. Nothing major just fun. AJC: I know you have a daughter in college. Any other children? Donna: I have a 23 yr. old daughter who is studying in Spain right now. I have a 21 yr. old son who is on a personal adventure traveling and working in western Canada. He is living the life of a skier-restaurant worker in the Rockies. One thing about my daughter is that she shares a love for design. She had her own apartment these last few years and put out a great effort to purchase everything second hand. It was so much fun to confer with her on her many ideas and purchases. She loves the "hunt" for a good bargain as much as I do! AJC: When you bought the house did you think you would stay in it this long? Donna: No, not at all. But I have no regrets. It has been a wonderful personal project ever since. I get to live my long ago dream of being a designer. As a teenager, I actually worked in an old home which was a show house for a furniture company. I loved design and really wanted to follow that dream but in those days it was not a very developed field and I was discouraged from following up on that. No real regrets though, but I do love to make all the design decisions and our reno guy knows that he is working directly in sync with me. So, it has all worked out. Donna: Yes, we have talked about moving. Our children are determined that we don't. ;) They want to hold on to the great memories. We love our home and everything about it. We have worked so hard at making it a great space for friends and family that it would be hard to give up. We have several friends that come here for holidays as their own home away from home and various "nieces" that have spent their summers here learning French. This house has seen a lot of "living" over the years that it would be hard to give up. We do dream of having a place in Tadoussac where we love to spend our summers so sometimes I wonder about a condo downtown and a house in Tadoussac but that is not in the plans really. For now, we rent a home there in the summer to live out that little dream. Donna, thank you so much for sharing your beautiful home and its story with us. 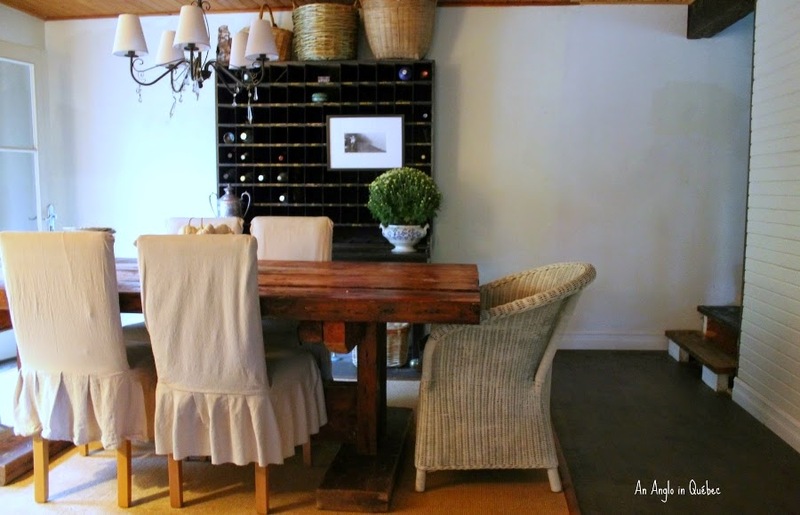 To see more of Donna's wonderful cottage and visit her delightful blog here. And to get the full story on her incredible kitchen renovation, including lots of photos, hop on over to here. Donna is an excellent story teller, so plan on spending some time there. Thank you for the introduction to another Canadian blogger. I love this series. I enjoyed this post very much about a fellow Canadian blogger. Of course, I love to read them all. 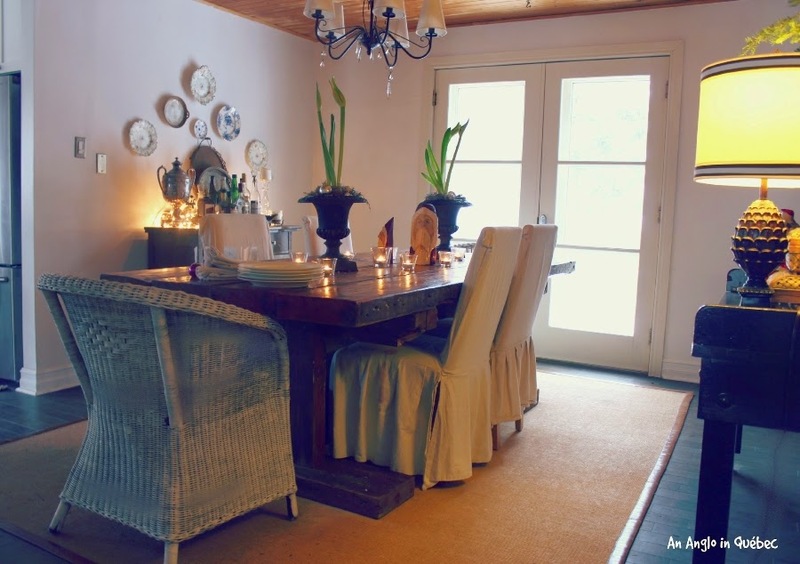 LOVE Donna's decorating style...her home is beautiful!! Her kitchen remodel is FABULOUS! 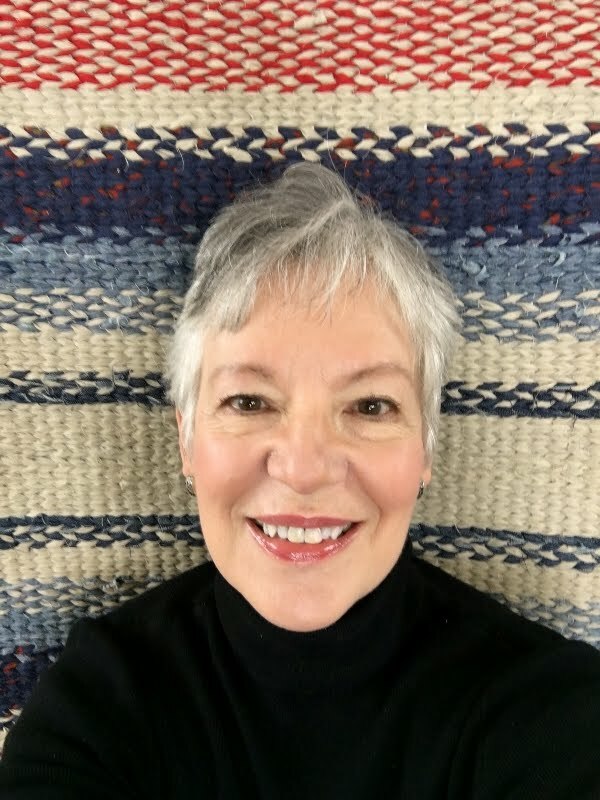 Awesome feature Nancy! Donna has the cutest house and is one of the nicest bloggers out there. Great choice! Very charming . . . I love these "cottage peeks" Nancy! Quebec is such a beautiful part of my native Canada, and having visited a few times, it truly has that European feel to it. Donna's house is charming. Really enjoyed this interview, Nancy! I'm so glad you featured Donna's house, I've long admired her home and think she's got such elegant style. 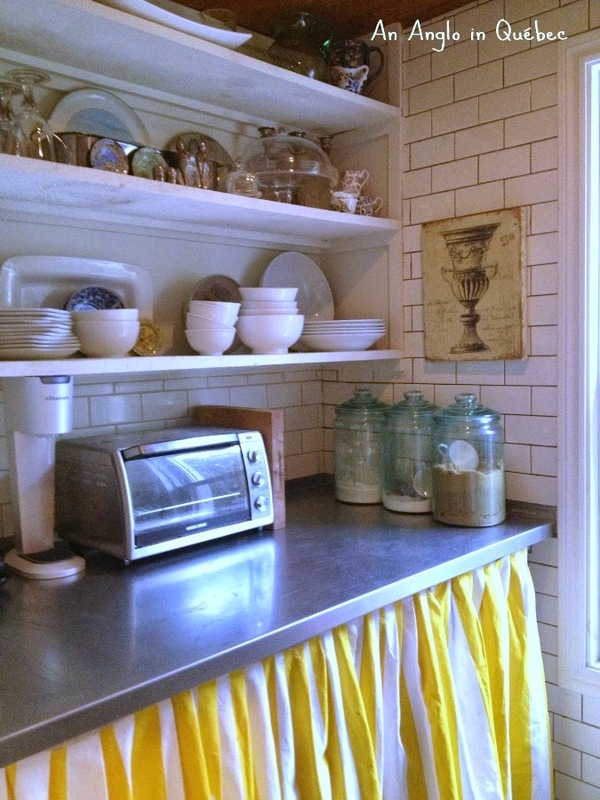 Her kitchen transformation is amazing and I love the work they've done on the garden. Donna, how could you ever think of leaving that house ! What a fabulous home, love that kitchen. Thanks for featuring it and Happy Valentine's day to you! 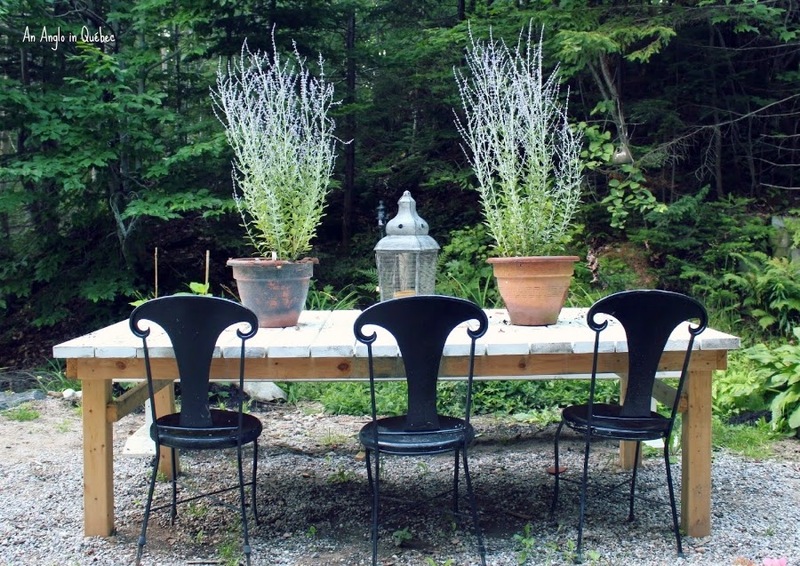 I love Donna's style, and oh my word, that backyard garden space!! I would feel like I was in heaven there. Isn't it inviting? I love it! Love that outdoor spot with the deck and the woods! Oh Nancy ... holy crap!!! I've fallen under the spell of Donna's Canadian cottage of wonderment!!!! I LOVE this place! Another beautiful tour of living large in a small home. She does have a wonderful talent in all the rooms she has decorated. Loved the ideas! Do they burn wood in the fireplace they added. It looks so cozy and warm. Hugs Marg. Hi Nancy !! I love these serie !! Y como me gusta toda la decoración de esa casa .. I love Donna's home! Nice job, Nancy and Donna. Good evening dearest Nancy! Another great feature that gives so much joy to the imagination. Like Donna and her husband, Ruben and I have stayed in our first "starter home" because so much love has been poured into it for over 18 years now. 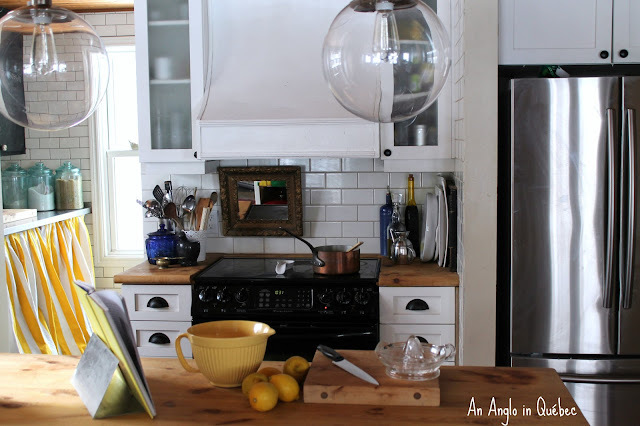 How gorgeous is her kitchen makeover! And the wooded area - who would ever want to leave? 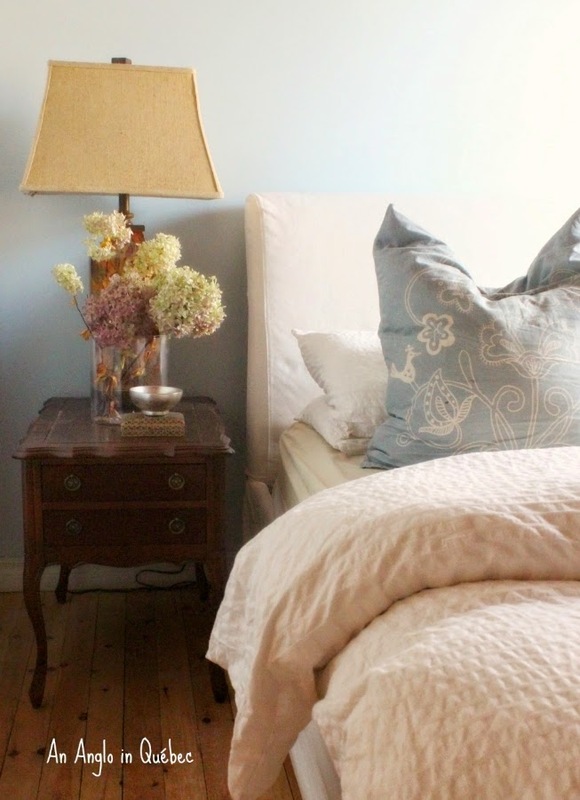 Small spaces are truly a gem to inhabit! I hope your building is underway now? LOVE Donnas home..been following her for a long time..great choice and thanks for sharing!!! I love Donna's cottage and her style. The reno's on her place are wonderful. Love that kitchen makeover. Thanks Nancy for another wonderful living large in small places home. What a wonderful transformation! I love the garden and that kitchen! 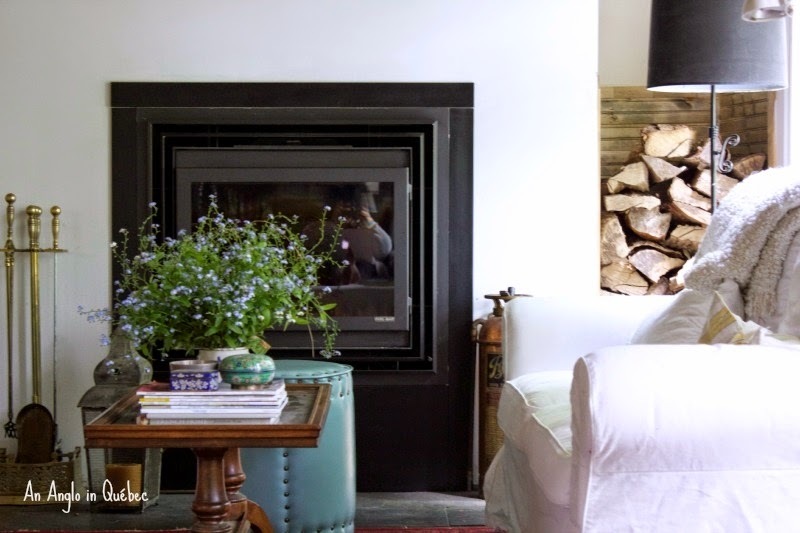 A fireplace is on my list for our next house, but I guess if I fall in love with something that doesn't have one it's good to know that one can be added and end up looking like it belongs! Thanks for sharing this charming house! The addition of the fireplace really makes the living room special. It was a smart move. Such beautiful touches all throughout the home. The kitchen looked amazing after the transformation! I loved the white brick look. I can see why her children don't want them to sell... what a remarkable little home with many special memories made there. Jack made a handsome addition to the pictures he was in, I can imagine how much love he brings to the home! 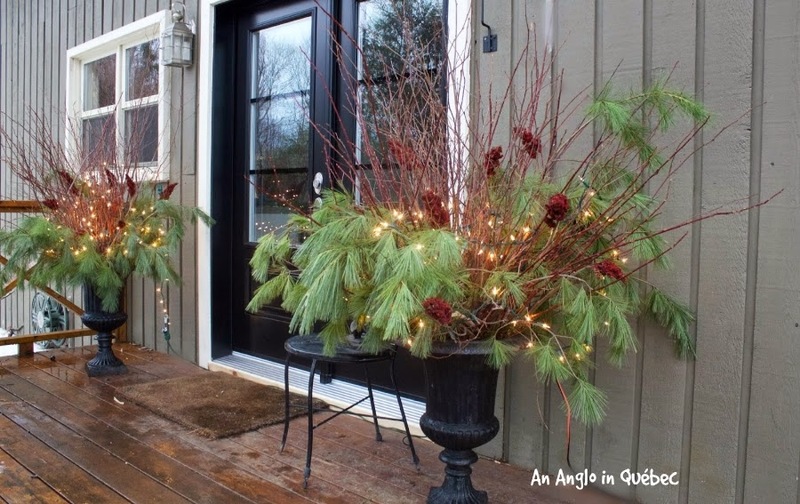 Thanks Nancy for another inspirational cottage share with us! 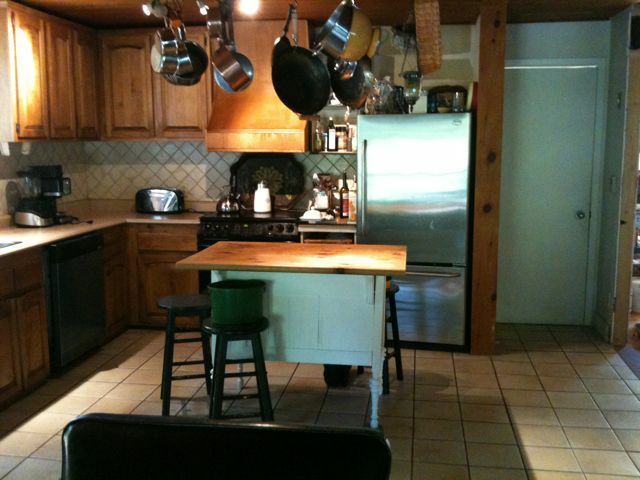 The change in the kitchen is remarkable. 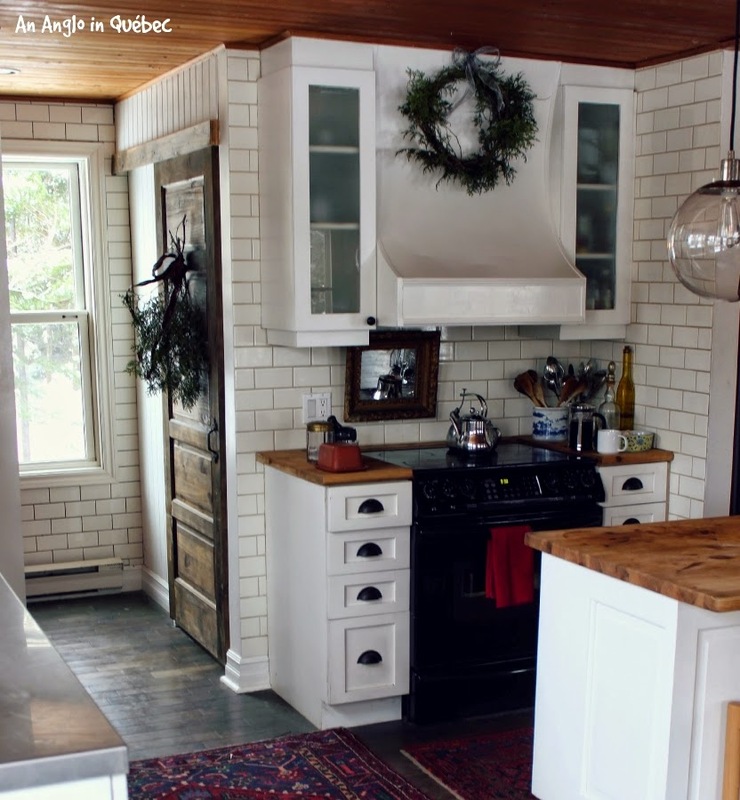 That subway tile is gorgeous! 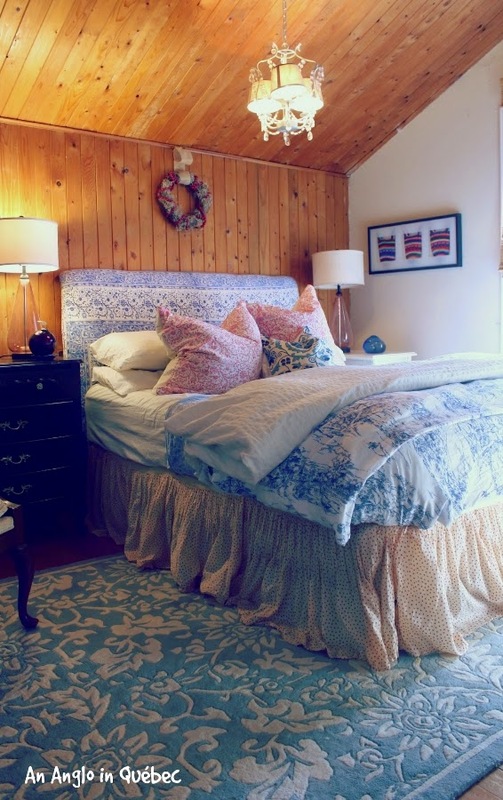 Such an adoreable little home...love the décor and just so cozy! Thanks for sharing! You're so right, Nancy... Donna DOES have a good eye! Thanks for introducing her to me. I love Donna's house. 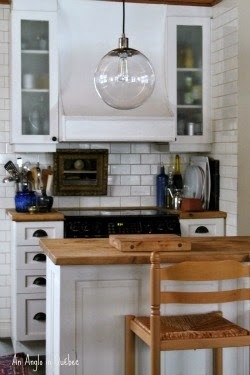 Her kitchen is fabulous and one of those that gave me hope before I began my kitchen remodel. It was definitely an inspiration. Her deck is also very inviting now. 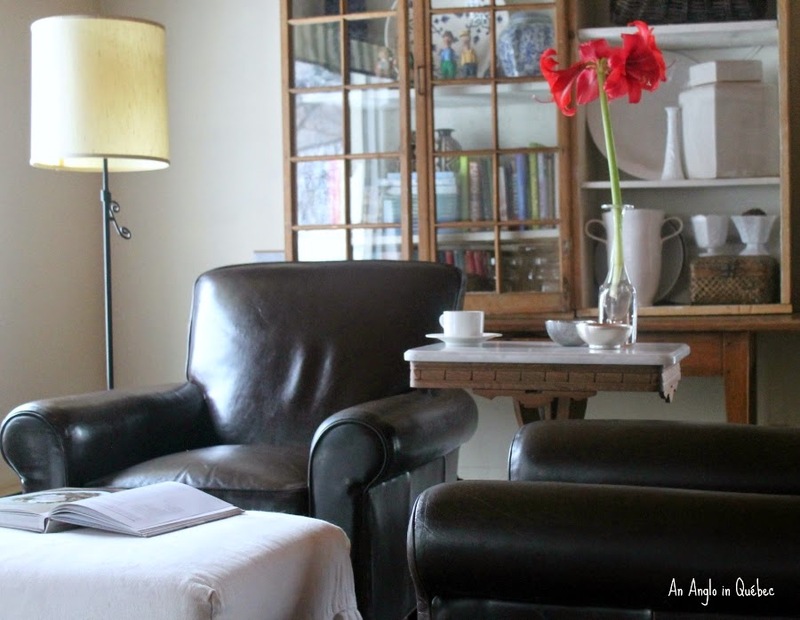 I follow Donna's blog as well and love the changes they have made to this beautiful space! Great job and loved the question and answer way you did the pst! Take care Nancy. Thank you, Dawna. I had a lot of fun working with Donna. Donna, thank you for this post. what a delightful home you have nurtured. no wonder you don't wish to leave it, right now. Wow, what an amazing Home Sweet Home! I enjoyed this post, thank you! Thank you Nancy for featuring our little home. It was a lot of fun to "chat" back and forth about "home" and what makes our own homes so dear to us. I love the idea that you are inspiring your readers to see that small is wonderful. 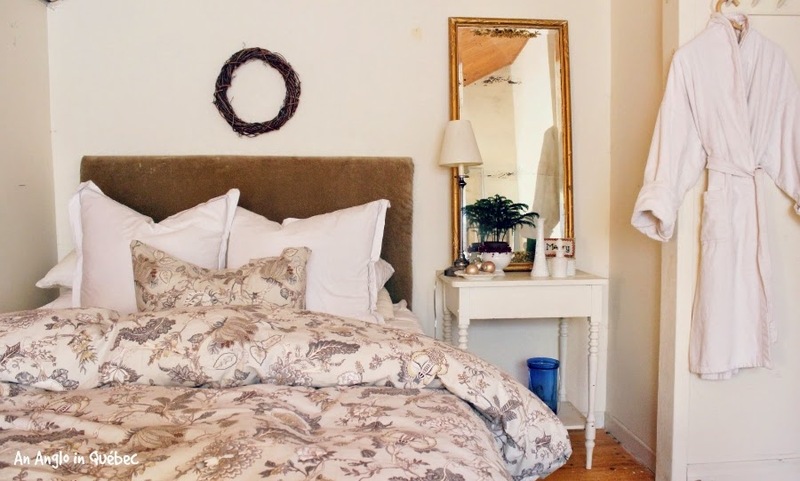 Another beautiful cottage to be admire and inspired by! Thanks for sharing another treasure. Hi Nancy, I followed through from Donna's blog. Great post and an interesting series, I'll be sure to revisit. This post is so encouraging since my husband and I have been looking at homes and everything in our price range seems to be really tacky 1970's chic. I love the transformation here, especially in that kitchen...wow! Fantastic job, and thank you for sharing your lovely home! 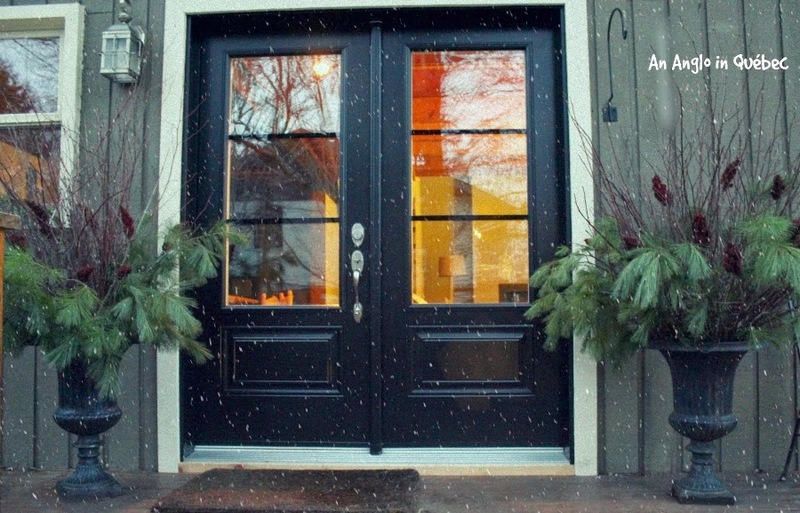 Donna's home is an inspiration for anyone who has or is thinking of a home renovation. It's wonderful that she turned it into such a great home and made it what she wanted. That little butler's pantry(?) is darling! How lovely to live that close to a ski resort - and one with snow. Our favorite California ski resort is desperate for snow. Nancy, I really enjoyed Donna's cottage and story! Fun idea to do a Q&A! Love the kitchen and the gardens are beautiful! Cute doggy as well. Thanks for sharing with SYC.